Helping You Write - Again! Other products by GRANDEE Corp. 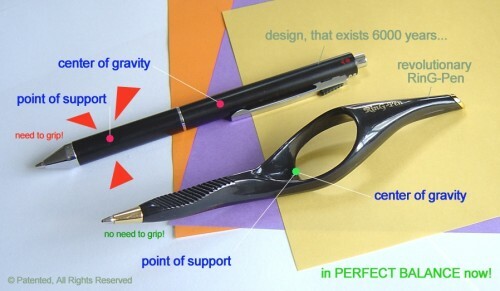 The Ring-Pen is the original ergonomic pen designed to relieve pain and cramping for people with arthritis, carpal tunnel syndrome, hand surgery rehabilitation, poor fine motor skills and writer's cramp. Benefits: Ergonomically designed to fit the human hand; Reduces fatigue while writing; No need to grip tightly with three fingers; Futuristic and awarded design.